What’s the ultimate goal of your eCommerce business? To make money, right? One of the easiest ways to increase revenues for an eCommerce business is to increase the amount customers spend on each order. In this post, we’re going to share 10 ways you can increase your average order value quickly and easily. First, let’s talk about what average order value is and how it’s calculated. What Is Average Order Value? Average order value (AOV) is the average amount each customer spends per transaction with your store. In other words, it tells you how much revenue each order brings in. It’s an easy calculation, but we recommend that you use Google Analytics to track average order value because of the additional benefits Google Analytics provides. To do that, you first have to enable eCommerce tracking in your Google Analytics account. 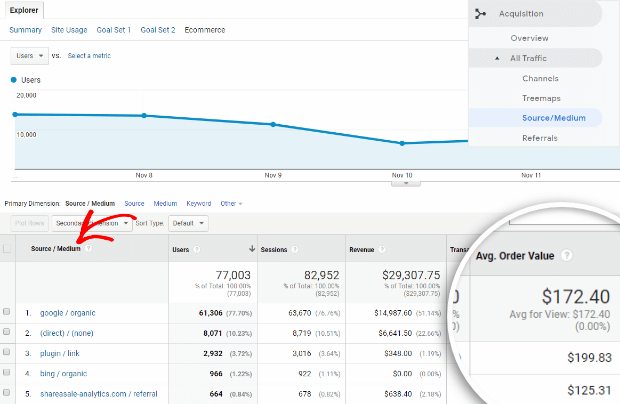 Once you have eCommerce tracking enabled in Google Analytics, go to Conversions » Ecommerce » Overview. You’ll see a nice chart as well as tables showing Revenue & Conversion Rate on the left and Transactions on the right. Average Order Value is under Transactions. You can also view average order value by traffic source by going to Acquisition » All Traffic » Source/Medium and clicking on Ecommerce under the Explorer tab. An obvious reason to want to monitor and track your AOV is with an eye toward increasing it, but AOV is also a useful metric. With the specific traffic information from Google Analytics, you’ll be able to better leverage your most profitable traffic sources or get rid of those that aren’t performing. Now that you have a better idea of what average order value is and how to easily calculate it, let’s talk about how you can increase your AOV with these 10 tips. About half of shoppers come to your store and immediately search for the item that brought them in. This results in smaller carts and, you guessed it, a lower average order value. Instead of trying to distract them on their way to the product they want, why not catch them where they end up with targeted product recommendations? You can highlight popular products, related products, or add social proof with a “Customers Also Viewed” section. Show customers pieces that complete the look for the item they’re interested in and they may just buy them all. Putting together a complete outfit takes the guesswork out of the mix and makes the job a lot easier for the shopper. 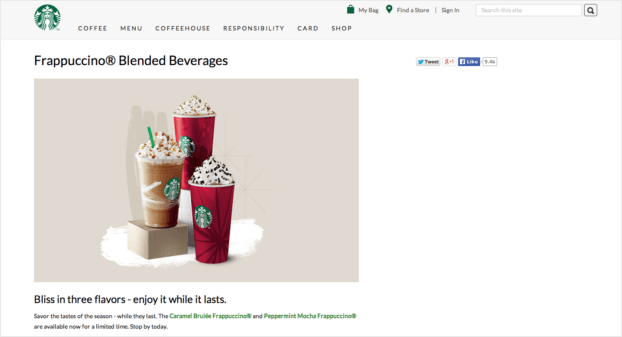 Upselling is pretty magical. And, it works. You have got to check out our post of upselling tips and examples for some amazing things to try out immediately. For now, let’s talk about the basics. Upselling is simply talking someone into buying the more expensive, flashier version of a product. 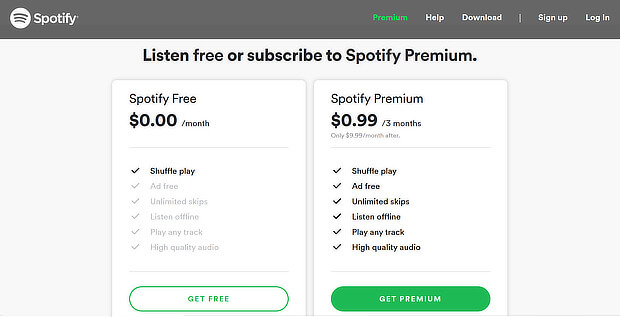 Spotify does it here by listing off all the cool things you get for your $0.99. Cross-selling is what you’re doing every time you recommend a related product. For instance, if someone buys a computer and you recommend a keyboard upgrade or an extended warranty. Setting up a minimum order amount to qualify for free shipping or other discounts is easy with eCommerce platforms like Shopify and WooCommerce. And, it’s a great way to increase your average order value. For example, you could offer free shipping on orders over $100 or a free travel mug on orders over $75. Whatever you can dream up and (legally) pull off, you can do. We recommend using a floating bar on your site to make sure your visitors don’t miss your incentive! Customer loyalty programs go a long way toward creating strong customer relationships and, well, loyalty. They also help to increase average order values. Loyalty programs are popular because they offer discounts to repeat customers, with the biggest and best discounts reserved for those customers who keep coming back time and again. You’d think with all those discounts flying around that these programs would actually eat away at your bottom line, but the opposite is true. Bundling products is similar to “completing the look” that we talked about in the section on suggesting related products. In addition to increasing your average order value, your customers will appreciate the ease of having ready-made bundles to choose from. Now they don’t have to do the research that goes into building an entire package to complete the set that they’re putting together. Plus, purchasing the items in a bundle is typically cheaper for the customer while still giving you a net positive in revenue. The value of the items when sold separately? $338.90. Not to mention all of the time saved. Want to increase your AOV even more and give your customers even more reason to love you? Add customization options to your bundles. For example, REI could offer the option of upgrading the type of sleeping pad or sleeping bag they offer or letting you add on an additional sleeping bag and pad at a reduced price. Check out our massive list of eCommerce personalization tools that will help boost your AOV and revenue to the next level. You can use a combination of popups to segment your site visitors as well as dynamically generated personalization tools that learn user behavior patterns to show customers exactly what they want to see. Personalization tools will look at the obvious things like what a shopper has viewed or clicked on your site, but they also dive deeper to look at browser type, device they’re using, order history, location, and more. Don’t let shoppers forget what already caught their eye. Fuego uses a Recent Items section to keep items handy that a shopper has looked at in their current session. Notice that they give shoppers the option to clear specific items from their viewing history or turn history off completely. Keeping recently viewed items on a shopper’s radar is a great way to increase your AOV if you have an indecisive shopper; they may need to “carry” the items around with them for a while before they commit. Price anchoring is a psychological marketing tactic that you can use in a couple of different ways. Most people accept the first piece of information they see (there’s the anchor) as the basis for their decision-making. So, if you have the first package priced higher than your others, the others then seem reasonable by comparison. In this method of price anchoring, you’re going to put your highest priced product or package between 2 lower priced products. The anchoring in this scenario will work slightly differently. When a shopper sees the first price, their brain will still register it as the anchor, but when they see the second price, that will obviously seem high. Seeing the price of the third product (similarly priced to the anchor) will then further establish that the anchor is a reasonable price. FOMO (“fear of missing out”) is a real thing. It’s why we all stay up past our collective bedtimes, scrolling through Instagram and refreshing Twitter. We don’t want to miss anything. That works well for you as an eCommerce business owner because you can take advantage of that desire to always be in on whatever is happening with our FOMO marketing tips. In terms of increasing AOV, you can create that sense of urgency with time-sensitive offers. No matter which ways you use to increase your average order value, you definitely need to test the effectiveness of your efforts. A split test, or A/B test is a method of testing multiple versions of a website (or individual elements of a site) against each other to see which produce the best results. Just like any experiment, if you’re testing the wrong things you’re going to get flawed results. For eCommerce businesses, that could mean losing revenue or customers. Be sure to check out our post on common A/B test mistakes to avoid to make sure that your split-test gets you the best AOV bang for your buck. There you have it. Ten insanely easy ways to increase your store’s average order value that you can do today, right now. Want more ways to boost revenue? Have a look at these eCommerce marketing strategies that will skyrocket your conversions or check out this post on what might be causing your low conversion rates and how to fix it! Hey! Did you know that OptinMonster is on YouTube? Check us out!